Will Idina Menzel Return for "Frozen 2"? Idina Menzel has a wicked sense of humor. When I caught up with the Tony winner last night at the AFI Life Achievement Award tribute to composer John Williams, I asked where Disney was at with the sequel to Frozen. "We are at story writing and they're working on it and I think I'm in it," Menzel said with a smile. "That's all I know—unless maybe Elsa falls off an ice cliff and she dies in the first five minutes." Menzel and I also talked about that epic reunion she had last month with Kristin Chenoweth. Kristen Bell Drops Frozen 2 Secrets! For the first time in 12 years, the Wicked co-stars performed "For Good," a ballad from the Broadway musical, for the Second Stage Theatre gala honoring the show's producer David Stone. A video of the duet posted on Menzel's Facebook has been viewed 11 million times. "It was so special for us. I was so glad I remembered the words," Menzel said. Like Chenoweth, Menzel told me she'd "love" to do more. "I love singing with her," she said. "I'd like to switch roles. That would be funny. I'd love to see her sing 'Defying Gravity.' She could put green makeup on and I'll wear the pretty dress." 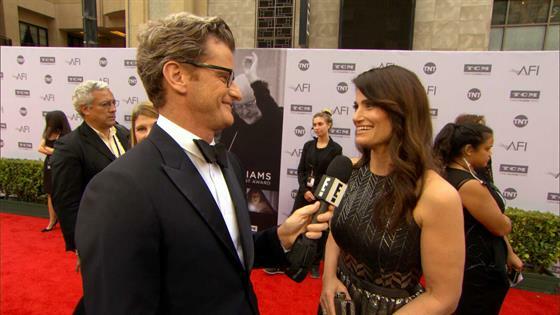 And don't forget to check out Menzel's very special appearance during the AFI gala when it airs on TNT on June 15. You can see a snippet in the video below.